Whether learned professor, nosy journalist, or hard-hitting detective, investigators need all the help they can get .Let this book be your guide. 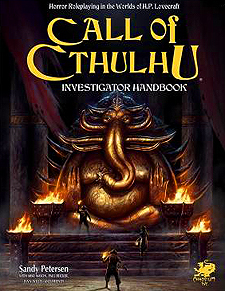 The Investigator Handbook is an essential player's aid for the Call of Cthulhu role playing game. Written for those who will be playing the roles of investigators, the Investigator Handbook contains expanded rules for creating players characters, a wealth of over 100 occupations and skill descriptions, and guidance on getting the most from the game. What's more, there are a range of organizations for your investigator to belong to, detailed information about the classic 1920s setting, equipment and weapons for both the 1920s and modern day, and expert tips and advice for all budding investigators. For Call of Cthulhu, 7th edition. You must have a least one copy of the Call of Cthulhu Keeper Rulebook to play Call of Cthulhu.